From the Vault: Tabu @ Gotham Awards | personal.amy-wong.com - A Blog by Amy Wong. 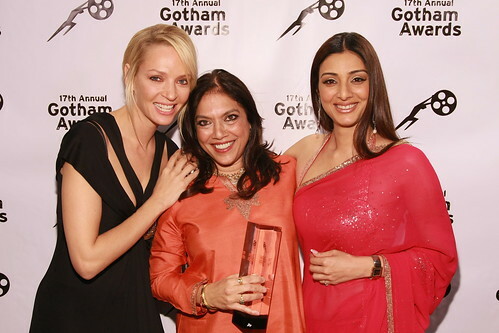 “So this is where that photo comes from,” was the first thing I said when I ran into this photo of Mira Nair celebrating her Gotham with Tabu and Uma Thurman. You can also get a sense of how tall Tabu is when she’s not dwarfed by Thurman, who officially is 1.81m but maybe taller (plus, heels). And it’s not because Uma is leaning to one side either, ‘coz on this pic where she’s much closer to the camera or this other more general shot, she’s not dwarfed either. Also how sweet is Tabu with Ang Lee? Having said that… Screening photos are such a waste of time coz they always look like horrible snapshots because these things are never lit, so you get all that harsh light of the flash bulb.